Questions that have been asked more than once. This is a full list of all questions in the FAQ. 1.2 Can I use OpenFOAM? 1.3 How can I properly reference OpenFOAM? 1.4 Where can I find support or ask questions about OpenFOAM? 1.5 How do the OpenFOAM versions, variants and forks differ? 2.1 How to install OpenFOAM and any of its variants? 2.2 Which platforms are supported by OpenFOAM ? 2.3 Why isn't there a Windows port of OpenFOAM ? 2.4 How do I port OpenFOAM to an unsupported platform ? 2.5 Why is OpenFOAM built and installed in my home directory ? 2.6 Why am I not able to install the official OpenFOAM Deb packages on Ubuntu ? 2.8 Why do I get the error message "fileName::stripInvalid() called for invalid"? 2.9 How to run the tutorials in OpenFOAM? 2.10.1 icoFoam or blockMesh cannot be found? 2.10.2 Compilation error, something about triad.C:36, what's wrong? 2.10.3 Weird error message: make: [install] Error 1 (ignored) - what does it mean? 2.10.4 CMake is refusing to configure my build of ParaView, what's going on? 2.10.5 wget keeps complaining something about an insecure connection? 2.10.6 Unable to build setSet without readline? 2.11.1 Wrong createFields.H file is included? 2.11.2 Strange error message: target pattern contains no `%'. Stop. 2.11.3 Unable to source the file etc/bashrc, unless I use the complete path? 2.12 How to uninstall/remove OpenFOAM? 2.13 What is root mode? 2.14 Why am I getting "Permission denied" when I try to run a local script or application? 2.15 Common problems and solutions for building software from source code that is in the ThirdParty folder? 3.1.2 Where do I enter the fluid-density for icoFoam, turbFoam and other incompressible solvers? 3.1.3 What is the field phi that the solver is writing? 3.2.1 What's the difference between the symmetryPlane and the zeroGradient boundary conditions? 3.2.2 What does the lInf parameter mean in pressureTransmissive boundary condition? 3.3.1 How is wall-functions for RANS disabled and enabled? 4.1 How does one turn off the dimensional checking? 4.2 Is there a way to switch between single and double precision? 4.3 Why doesn't my solver have any residuals for the velocity equations? 5.2 How do I set up a two-dimensional axisymmetric problem? 5.3 How to export a Fluent mesh in ASCII? 5.4 How to convert Fluent mesh to OpenFOAM? 5.5 Why do I always get the error message "cannot find file" when converting a mesh? 6.8 I'm using Ubuntu, where is the main menu in ParaView? 6.9 Using the internal reader in ParaView cannot load unknown boundary conditions? 7.1.1 Where does wmake get the values for the environmental variables from? 7.1.2 What does "-lOpenFOAM" and '-lfiniteVolume' mean? 7.2.1 How to calculate the field value of an arbitrary point? 7.3.1 What is the object registry? 7.3.2 What do the filenames mean? 7.3.4 What is runtime selection? 7.4.1 How do I add a new wall-function? 7.4.2 How do I add a new boundary condition? 8.1 An application ends with a segmentation fault. What is wrong? 8.3 I'm unable to reproduce a crash. What's going on? 8.4 Cannot open script file? 8.5 Cannot use the -fields option in foamToVTK? 9.1.1 Where do I find rhoPorousSimpleFoam etc ? 10.3 Why doesn't FoamX allow me to enter numbers? 10.4 How can I make a solver stop if the solution contains NaNs ? 11.1 Is this Wiki affiliated with OpenCFD/ESI ? 11.2 Am I allowed to contribute? 11.3 I found an error/outdated information/missing stuff. Whom do I contact? 11.4 If the policy is so liberal why do I have to apply for an account to edit? 11.6 Are there any rules to what should go where? 11.9 How to use OpenFOAM version templates? 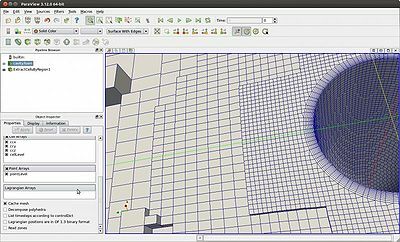 11.10 How to create new OpenFOAM version templates? 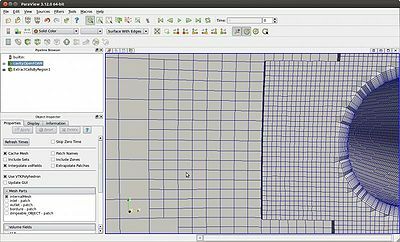 11.11 How to create new template images for the OpenFOAM versions? Yes. OpenFOAM has been released by OpenCFD under the terms of the GNU GPL 2 license. According to this licence, you can freely download, install and use OpenFOAM. Moreover, you have full access to the source code of OpenFOAM and you can modify it to customize it on your needs. You can cite the www.openfoam.org website, if web-referencing is allowed, otherwise, cite the OpenFOAM documentation. You can ask questions on the OpenFOAM message board. For a direct access to the IRC channel click here, if you have a browser configured to start your IRC client. The OpenFOAM Discord channel can be accessed here. According to the admin the goal here is to provide a live discussion, for small questions that maybe don't deserve a new thread on the forum and obtain instant help. It is more suitable for beginners, as advanced questions may need developed answers, thus the forum. There a couple of subreddits where you can read or ask OpenFOAM related questions. The r/OpenFOAM is dedicated to OF, but r/CFD is also a good place to look for. for corporations, consultants and academic institutions there are plenty of paid services available, listed at Frontpage links template page. Version 4.0 is the current stable release, which the latest stable version to be released as binary. This should be the version of choice for most users. OpenFOAM 4.x is the official bug fix branch and thus contains the newest bug-fixes and features, but comes at the price of being less tested. This includes OpenFOAM+ (plus), the foam-extend project and Caelus-CML. FoamX was only developed up to OpenFOAM 1.4.x and is obsolete as of version 1.5. For more information, read the section Appendix A: The FoamX case manager from the Main UserGuideAddendum, which has got annotations concerning the OpenFOAM User Guide. Warning: Estimated amount of time necessary to get FoamX (barely) working with any of the latest OpenFOAM versions: 40 to 80 hours of dedicated work in coding in Java, depending on your level of experience. There is also a Cygwin Porting for Windows here. The instructions for the official OpenFOAM versions are provided at the OpenFOAM Foundation website. The instructions for the Extend variant foam-extend are provided at the Wikki website, in the page Download & Install. Instructions written by the community are mostly centralized here at openfoamwiki.net, in the page Installation. Officially, only Linux Distributions are supported: OpenFOAM Repo: 1. Software for Compilation. But POSIX systems in general should be compatible, with a few changes here and there. Beyond this, visit the page Installation for a more up-to-date list of known (unofficially) supported platforms. Actually, nowadays, there are a few ports for Windows. The only feasible way in the past, was to port OpenFOAM to Windows using Cygwin, an application that implements the most common UNIX APIs on Windows. Now MinGW is the more popular porting solution, because while it still integrates parts of Cygwin (MinGW forked from version 1.3.3 of Cygwin ), it can run natively in Windows and be linked with other native Windows libraries and applications. One problem is that the file-system NTFS, that is used by most modern Windows Versions, is (by default) only case-preserving (hello.c and Hello.C are the same file, when in the same folder). The OpenFOAM-sources need a fully case-sensitive file-system and can't even be unpacked properly on a Windows system (see ). There is a possibility of enabling full case-sensitivity in Windows , but can lead to some Windows programs to not work properly. A (relatively old) way to compile OpenFOAM on cygwin is described on the Message-Board. The resultant binary distribution of version 1.3 is available here (and there is a relating discussion thread on the Message-Board). This port does not include FoamX and paraFoam, although postprocessing can be done with ParaView by using foamToVTK, and FoamX exists for OpenFOAM 1.4.x. This port is not part of the official distribution. Another unofficial port of OpenFOAM 1.4.x is available here, with FoamX and ParaView. Support is available here and here. FreeFOAM should prove to be more successful, but it's still in development, and uses CMake instead of wmake. Cygwin 1.5 introduced a mount type named managed mounts, that can handle fully case sensitive files and folders, and some special characters that Linux can use and Windows can't . In theory, if OpenFOAM is built under this interpretation layer, than it should be compilable directly in Windows. After some testing, it was discovered that OpenFOAM has some very long path names, which aren't handled properly by Cygwin's managed mounts, due to path size limit . With Cygwin 1.7, managed mounts were dropped and POSIX mounts were introduced , as well as file paths increased to 4096 characters . The POSIX mount relies on a hidden feature of Windows , that enables NTFS POSIX compatibility system, also used by Interix's SFU/SUA , thus enabling full case sensitivity. In other words, as of Cygwin 1.7, it is possible to compile and cross-compile OpenFOAM directly in Windows, without major reconstruction of the files and structure of the source code. Nonetheless, the whole build system has to be done under Cygwin's layer, because the flag obcaseinsensitive doesn't actually make all of Windows applications aware of full file name case sensitivity. For more information, see Using Cygwin for cross-compiling OpenFOAM. There are already a few variants of cross-compiling with MinGW and one port that compiles directly in Windows with MinGW and CodeBlocks. The complete list is available here in the wiki. This link is part of a full step-by-step tutorial on how to Cross Compile OpenFOAM in Linux for Windows with MinGW and Mingw-w64. If your platform is not some kind of UNIX-flavour you're probably going to have a hard time. For a starter see Porting to a new platform. Unfortunately this is not a winning situation for everybody. If you build and install OpenFOAM in your home directory you can't use it on heterogeneous machines on a network, i.e. a z80 based machine cannot run OpenFOAM compiled for a 6502 based machine, unless it has emulation software in which case it would be slow. Fear not because it is possible to configure OpenFOAM to compile and install in a common directory on each machine to accommodate heterogeneous machines on a network. Hit the key combination Ctrl+X, press the Y key, then the Enter or Return key. A name can start with an alphabet character or an underscore. A name cannot have spaces in it. A name cannot start with a digit (0 to 9), but it can have digits in any other place of its name. This rule mostly applies to the names of items inside OpenFOAM dictionaries, where the only exception is regular expressions can be used inside dictionaries. Now please study chapter 2 in the OpenFOAM User Guide. The simplest way to run a tutorial in OpenFOAM is to run blockMesh followed by the name of the solver, such as icoFoam. To know the name of the solver in question, have a look into the file system/controlDict and see the name defined for the keyword application. In OpenFOAM 2.1, the tutorial incompressible/simpleFoam/motorBike has got the Allrun script. Also in OpenFOAM 2.1, the tutorial incompressible/icoFoam/cavity does not have the Allrun script, but the parent folder incompressible/icoFoam does have that script. This means that this Allrun script will run all tutorials within the folder incompressible/icoFoam. This section of the FAQ addresses many of the known common building errors that can occur when building OpenFOAM from source code. It is not a thorough list, but it should at least help with some of the more common issues. In addition to this, please keep in mind to use a compiler version which is known to be compatible with OpenFOAM, for which a list is being kept in the page Installation/Compatibility_Matrix. make: Target `application' not remade because of errors. This will make a full log into the file log.make, including errors that are outputted during the building process (i.e. "2>&1" does the redirect of stderr to stdout). You can then check if there are any errors by opening the file log.make with a text editor and search for lines have the expression "Error " (including the space after the word "Error"). Keep in mind that if your terminal is returning error messages in another language, then you should search for the respective word for "Error". If you do find errors, the first one is usually the one to blame for all of the other errors after that. Unless of course you've spotted the error explained in the subsection below, namely: Weird error message: make: [install] Error 1 (ignored) - what does it mean? - in that case, you can ignore that particular error message and search for the next one, if there is any. Once you've spotted the first real error message, search online for the main keywords in that error message, because it has likely already been found by other people and already solved. As of OpenFOAM 2.2.0 it was no longer possible to compile OpenFOAM with GCC 4.4 and older. At that time the limitation was introduced in a somewhat artificial way, because the authors no longer could support building OpenFOAM with all versions of GCC from 4.3 to 4.8. More detailed information about this is provided on the following forum thread: Compile Error of OpenFOAM-2.2.0 on RedHat EL5 - but the short solution is simple: upgrade to using GCC 4.5 or newer. This particular message occurs usually only occurs when cleaning up the Scotch building folder and can be ignored. If there are any problems, it's not because of this error message. The explanation is simple: Scotch's building procedure requires one to build it directly in the source code folder, which makes it a requirement to clean up after the building and installation steps are complete, so that one can also build other architectures of OpenFOAM and Scotch. For example, if you need both 32 and 64-bit builds, you will need Scotch's source code folder to be cleaned from the previous build, so that the next build can occur with success. When you're using a CMake version that is not compatible with the CMakeLists.txt present in the source code you're trying to build. When there is a conflict with another custom installation of CMake. Therefore, the two above are somewhat related: either you need a newer CMake version or the one you're using is too new. Either way, you will likely have to build a custom CMake version. Then you should be able to use the custom build of CMake you've made for building ParaView. ERROR: certificate common name `www.github.com' doesn't match requested host name `raw.github.com'. As the command implies, it's an alias for the command wget, which will automatically use the options defined in the command above. Now, please keep in mind that this can be considered a security risk, because this means that you'll be accessing a secure website through HTTPS, but without a valid certificate for said communication. This is usually because the local copy of the certificate list installed on your system is outdated and you can still go ahead safely with the download. But in some situations it might mean that either the target website is in fact insecure/compromised or that there is a man-in-the-middle attack going on; this could at the very least mean that the data you're getting might be getting corrupted on download. Found <readline/readline.h>  --  enabling readline support. Notice the very first line on the start of this description? Namely "enabling readline support"? The reason for this is that the readline library is only partially installed, where the header is present but the respective library isn't. If all goes well, it will have built setSet successfully without the readline library. This section of the FAQ addresses many of the known and very rare building errors that can occur when building OpenFOAM from source code. It is not a thorough list, therefore please do add more as needed. This was detected while debugging report #2386 at the OpenFOAM Foundation bug tracker. then the colon at the end is breaking the installation path. It seems to be a hard to reproduce bug in GCC, where an open definition of a path will lead to the first directory include path -I. be ignored. $HOME/OpenFOAM/OpenFOAM-2.1.1/wmake/Makefile:148: *** target pattern contains no `%'. Stop. GREP_OPTIONS was set in the shell environment with the option -n for also listing the lines where it occurs, which is used by grep, but which can affect all calls to this application, including within OpenFOAM's scripts and give weird outputs. This was reported in #2310 at the OpenFOAM Foundation bug tracker. This was a bug that was introduced before OpenFOAM 4.0 was released, but it was fixed with the aforementioned bug report #2310. You need to fix your personal ~/.bashrc file, in order to remove the command line that loads the OpenFOAM shell environment. For more details, please refer to the section: Using aliases to help manage multiple OpenFOAM versions in the page Installation/Working_with_the_Shell. Now check below the paragraph entitled "Common to all instructions". The same is applicable for RHEL. All Operating Systems usually have at least one administrator account, which is able to control all aspects of how the operating system that is installed in a computer (aka machine) and what other global installation packages are available to the users of that machine. In Linux and most Unix-like operating systems, there is a primary account named root, which is the primary (and usually only) administrator account (also known as the super-user). Login as root, instead of logging in a as normal user. Note: Do not login as root for using the Desktop interface. then you're in root mode. for giving the execution permission to the file Allrun. This is because in these file systems, files and folders have at least types of permissions per category: read, write and executable. For more details, read about chmod. In contrast, other operating systems (like Microsoft Windows) will simply rely on the file extension in order to know if the file is executable or not, for example: calc.exe where .exe is what tells the operating system that this file alleges to be executable. -R is for recursively go into sub-folders. +w is for making it writable. The lists of common problems for each Third-Party software that OpenFOAM relies on is being maintained on dedicated pages. The sections on the wiki dedicated to that software is listed in the Category:Installing Third-Party software. A table of the fields most commonly written by OpenFOAM-solvers can be found here. You don't. Instead of the dynamic viscosity the kinematic viscosity is used by the OpenFOAM-solvers. Note: the pressure has to be normalized with the density, too. One consequence of this is that the dimensions of pressure become pressure divided by density. The mass flow through the cell faces ( with the area of the face). Keep in mind that solvers for incompressible flow will unlikely use . For more information, see also this table. The zeroGradient boundary condition sets the boundary value to the near-wall cell value. A symmetryPlane boundary condition is a symmetry-plane which is equivalent to a zeroGradient for scalars, but not for vectors or tensors. All high-Re RANS turbulence models include wall-functions because it is inappropriate to use them without. Only the low-Re models operate without wall-functions as they include model-specific wall treatments. Has OpenFOAM been used to calculate this type of problems? They are implemented in twoPhaseEulerFoam. Have been done. Will be released. For details see this thread on the Message Board. Dimensional checking is one of the cool features in OpenFOAM that helps to develop solvers that do something physically meaningful. Therefore: don't do this if not absolutely necessary. For more details on how to set these options, see section Getting built-in feedback from OpenFOAM at HowTo_debugging. A more controlled way is to use the dimensions()-method to set the dimension of the volXXXField in question to the desired dimension. Only by editing src/OpenFOAM/primitives/scalar/scalar.H and recompiling OpenFOAM. But why would you want to do that (except for memory issues)? Recompile OpenFOAM with single-precision enabled, by setting the environment variable WM_PRECISION_OPTION to SP. For more details, see section OpenFOAM Environment Variables at Installation/Working_with_the_Shell. Look inside the SIMPLE, PISO or PIMPLE block that you have configured for the solver you're using. You will find that you probably have momentumPredictor set to no. You use a contributed utility called makeAxialMesh. file: /home/ofuser/Desktop/system/controlDict at line 0. Well, the error message should be self-explanatory: it cannot find a file that doesn't exist, namely the file system/controlDict. This is because OpenFOAM's applications almost always need a configured case folder to work in, so that it can know that it can operate within that folder and what are the settings to be used for doing what you want it to do. The first one is what you're looking for. Then it runs the solver and then it runs the commands for exporting the mesh and then results to Fluent format. The following subsections describe the basics on how to post-process by Using foamToVTK and by Using paraFoam. the tutorial page HowTo Post-process results for particle based methods. 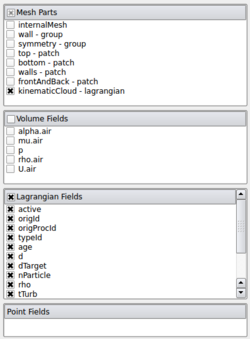 With the latest OpenFOAM and ParaView versions, it's possible to post-process Lagrangian data directly in ParaView. However, if for some reason you cannot open the OpenFOAM case directly in ParaView, the workaround is to use foamToVTK and ParaView's existing ability to handle point data. Run the foamToVTK post-processing utility. As with all OpenFOAM programs, it requires at a minimum, the root and case paths. Read in your Eulerian data, if you wish. Read the Lagrangian data separately and 'Glyph' it. Glyphs are how ParaView represents point data. Usually, the sphere glyph is the most appropriate. The glyphs used to represent particles can be colored and sized to reflect the data associated with the particle. If you cannot see your particles, check that indeed you have represented them as glyphs and that the size scaling you have chosen is adequately large. First you execute paraFoam as usual but you select only in the data to be load the fields and the mesh of the continuous phase. In Volume Fields unselect everything. In Lagragian Fields select the fields you are interested in. Example from ParaView using the .OpenFOAM case reader, showing which fields to select. Then click on the Apply button. To visualize the particle, use the Glyph filter (cf. end of previous paragraph). Remark: Should work as of OpenFOAM-1.6 and ParaView 3.6.1. People usually tend to use the filters Slice and Clip to diagnose the interior mesh of a case. Although it's an idea in the right direction (wanting to look inside the mesh), it will not give you the best results for assessing if the mesh is OK or not. This is because these filters require that the polyhedral cells in the mesh be decomposed to tetrahedral cells and the resulting surfaces will all be composed by triangles. To the right is an example of selecting the Use VTKPolyhedron option in the official reader, which usually appears when the file extension .OpenFOAM is used. Notice mesh representation shown in 3D by the filter Extract Cells by Region. Example of selecting the "Use VTKPolyhedron" option in the official reader. To the right is another example of how to not select the Decompose polyhedra option when the file extension .foam is used. Notice mesh representation shown in 3D by the filter Extract Cells by Region. Example of not selecting the "Decompose polyhedra" option in the internal reader. In addition to visual inspection, ParaView provides a Mesh Quality filter that is useful for identifying degenerate elements. It assigns a floating-point "quality" to each cell (many of these quality metrics are related to the condition number of the Jacobian which is used during numerical integration). Once the quality has been computed for each cell, you can use the Threshold filter to isolate only those cells that misbehave. Rendering the original mesh with transparency turned on (or in wireframe mode) will show the thresholded cells even if they are inside the mesh and would not otherwise be visible. Otherwise, at least in most OpenFOAM versions, the default file extension used is .OpenFOAM, which usually is associated to the official OpenFOAM plug-in for ParaView, which needs to be built from OpenFOAM's source code. Note: The following description assumes you've already studied the topic Using the internal .foam reader in ParaView. Using reconstructParMesh is only needed when a new mesh was generated in parallel. Usually this happens when using snappyHexMesh in parallel. Using reconstructPar should work on all other situations, where it will reconstruct the fields and dynamic meshes. Then you can open the respective files for the respective sub-domains that are related to each processor* folder. Example from ParaView 4.1.0 where the option for reconstructed and decomposed case type is selectable. As mentioned before, the topic Using the internal .foam reader in ParaView already addresses the fact that the internal reader can be used in many cases. What might not have been mentioned, is that there is an option to open the decomposed case, instead of using the default option of opening the reconstructed case, as shown in the image on the right. The idea here is that this will allow you to post-process the case without having to first reconstruct the case. Look at the top bar on your screen. See the menu appearing there? There are several special boundary conditions in OpenFOAM that do not write/use the entry value in a boundary condition, which leads to the internal reader that opens with the file extension .foam to fail to load the fields. Artificially add the value entry with Template:ChangeDictionary. Use foamToVTK to export the results. Use the official OpenFOAM reader that is built with OpenFOAM. For a complete list of foam related environment variables, see Environment_variables. The interface files: libOpenFOAM.a, libtriSurface.a and libmeshTools.a - these are always needed for building on Windows with GCC. See Calculating the field value at an arbitrary point. exampleClassI.H - Inline functions implemented. exampleClassIO.C - IO functions implemented. exampleClassFunctionName.C - FunctionName's implementation (seperated for no other reason than aesthetics). Some filenames add an s to the end. These may be associated with static variables / functions. They may also be associated with the NoRepository flag. See the How-To: Adding a new wall-function. See the How-To: Adding a new boundary condition. The reason for this is that OpenFOAM has got several function overloads for sqrt for dealing with fields, but it does not overload the original function sqrt, which leads to the compiler getting confused with which overload it should uses. A segmentation fault usually occurs when a program tries to access memory outside its bounds (see Segmentation Fault on Wikipedia). In OpenFOAM this usually occurs when a List<> or similar is accessed with an index outside of the allocated domain. To find out where this occurs see make a separate copy of the OF-sources, recompile them with the switch WM_COMPILE_OPTION set to Debug (just uncomment the right lines in the bashrc/cshrc files). This makes OF run slower, but accesses to List<> etc are checked for ranges and the program aborts if you access outside of a range (plus you get a stack trace). This won't solve your problem, but it will help you find out where it occurs. See also General debugging tips. For recompiling OpenFOAM look at Installation (specially page Installation/Working_with_the_Shell) or the older page Howto_compile_OpenFOAM. There could be a numerical instability in the calculations. This could be due to the compiler options used (such as --fast-math). There could be some randomness introduced somewhere by a pseudo-random number generator. This is common in the particle/chemical type solvers in OpenFOAM. The OpenFOAM environment is not properly activated. For more details, read Installation/Working_with_the_Shell. because the parenthesis are needed for the list that OpenFOAM was complaining that it wasn't finding and the quotes are needed for the shell to not think that this was a sub-shell request. These solvers are found in $FOAM_TUTORIALS along with their example cases. You have to compile them yourself before using them. FoamX is set up to run on a system where the default language is English. If you want to run it on a system which uses another language, you have to manually modify the ~/OpenFOAM/OpenFOAM-1.3/bin/FoamX script. at the end of the same file, replacing your_LANGUAGE_CODE with the corresponding code of the language in use in your system (for example, it_IT for italian). in the last part of the FoamX script so that it looks like as follows. No. This Wiki is a community effort. Its aim is to give people a place where they can collect/publish information about OpenFOAM and related projects. In the past lots of accounts were created by programs (so called bots) for spamming purposes. As this couldn't be prevented with automatic measures it is now necessary that people apply for an account via this form. The application will be reviewed by a human (usually within a workday) and an account will be created. A short (200 characters) biography. Information of interest is your current affiliation, your formal qualifications and what you're using OpenFOAM for (or what you're planning to use for). Applications where this is nonsense or copy/paste from other places will be denied. After the creation of the account almost all pages can be edited. Yes there are. They can be found here. But they are a bit outdated. Most of the time common sense and looking at how other people did it is sufficient. The category Category:Incomplete pages lists all of the pages that are known to be still incomplete. Feel free to browse through them and to pick a topic to study upon and to then add information to that page based on what you learned. The page FAQ/Wiki/Ideas provides a good list of ideas for new pages and for improvements to existing pages. The Installation page can always use more help, so browse around there and be sure to read the help sections at the end of each major installation topic. This is discussed here. The reason is that for performance reasons the Wiki-software caches queries with dynamic content and changes might take a couple of hours to show up. See the page Help:Editing, section Version Templates. The first option - "22" - is the version name for the image file associated to this version. The second option - "2.2" - is the version number used for the category name. The third option - "V" - is meant to either be "v" or "V", because some image files used the name "version" and others use "Version". The reasoning for each argument is the same as for the description made for the (official) OpenFOAM version templates. Therefore, be sure to use the same convention. Unpack it in your own computer. OF_Dev_Version_Major.xcf - This is for the old "-dev" variants of OpenFOAM 1.4 and 1.5. The objective is to edit the desired template file and modify the text layer for the version number and update it. Export in Gimp the resulting edited file to PNG. As for the name of the file and upload to the wiki, check the section How to create new OpenFOAM version templates? This page was last modified on 9 October 2013, at 11:52. This page has been accessed 49,466 times.